There was supposedly a ‘Super Moon’ this weekend, the biggest the moon that we’ll see this year blah, blah, blah. I’m not sure if y’all think like me but a full moon = weird things happening. I’m always affected by the full moon. Correction: affected by those affected by the full moon. This weekend was no exception in fact, things exploded at my house. Not literally or I’d not be here to tell you about it. Two Friday’s ago, one of my uncle’s passed away. (Uncle in law I think they call it? My blood aunt’s husband) Not knowing he was even ill or in the hospital for treatment was kinda crushing and slightly insulting but I can sympathize with my aunt and cousins on this one – who likes to call to spread bad news right? Besides it was supposed to be a routine procedure etc. Things went well and he was on the road to recovery. Why would anyone think about sharing this info? After all, we do live on opposite sides of the continent. Once things got sorted out and funeral plans made, flowers ordered because we aren’t able to fly over, we finally got a chance to ask questions and learn what happened. Apparently I was one of the first few people my cousin called to inform. I guess it was so I could share the news with dad. (He’s kind of like the patriarch of the family) And indeed, on that Friday, both my the hubster & I were shocked to see my cousin’s phone number on my cell phone. You see, we don’t call one another. We normally keep in touch via email or go through Facebook. Since that Friday, the hubster and I began worrying about dad. He’s up there in age and hearing of his brother in law passing away suddenly (because we didn’t know he was ill) was a huge shock. Dad takes time to process things in his mind. Yes, he had heard what I told him but it didn’t register until a few minutes later. We offered to take him to the west coast for the funeral so he could be there for my aunt but he said “No, we couldn’t go.” We thought it was a financial thing which then the hubster offered to pay all expenses (airfare, insurance, car rental etc) “No.” he said again. Followed by silence which meant the discussion was over. Being born and raised in Canada, my siblings and I were raised to follow the Canadian customs before our own Chinese customs. Most of the time we were shielded from a lot of things and simply told what to do but not why we did those certain things. IE Rituals, ceremonies, following superstitions etc. Not knowing what the Chinese custom’s were for a funeral/death, we didn’t know what to do. Not being able to read dad’s mind and him not wanting to share what he was thinking with us, we were left to guess what he wanted to do. Us kids only knew what to do for a North American style funeral. At one point dad kept flipping his mind back and forth between sending flowers and not sending flowers. Final decision was to NOT send flowers. There were several witnesses. The next morning, he bit my head off for NOT having ordered them already. All I did was walk into the kitchen and turn on the coffee maker. Uh, good morning to you too dad. But then he really laid into me. For no reason. This is where some would say that because my dad is older, my uncle’s death forces him to think about his own mortality. OR because dad is older, he could be starting to show signs of Alzheimer or Dementia. OR death/funerals make people act all weird. People grieve in their own ways. I do not care what excuse you make for him. No one deserves to be spoken to like that, especially first thing in the morning. Unprovoked. I had no problems ordering the flowers but if you change your mind in the middle of the night and do not tell me, you can not expect me to have ordered them. After this blow out, I was done with this whole funeral ritual and rules thing that was only playing in his head. I was tired of walking on eggshells around my father. I know he’s a man of few words and does not show emotion (besides anger apparently) nor affection. He’s old school. I get it. But enough’s enough. I’m the one that’s always there for him and this is how he treats me? Then in a knee jerk reaction, I lost my temper and any respect I had for him and blasted him right back. I cited examples of his inexcusable behaviour and simply told him that he was my uncle too, not just his brother in law. I asked him to make his final decision and that I would be done with anything related to my uncle and his funeral. Selfish? Totally. Inappropriate? Totally. Uncalled for? Oh hell to the no. After that day, I have been thinking about dad more then I usually do and how much I do for him and how much he takes me for granted. Most children, when they get married, they move away from their parents and family home to start their new lives together. The hubster and I decided to move in with dad and be one big family. In Asian cultures, its normal for parents to live with their children. They help around the house, they help with the grandchildren if applicable and when its their time for needing care, the children take on that caregiver role. The children turn into that ‘Sandwhich’ generation caring for both their own children and elderly parents at the same time. Its supposed to be an honour thing. To me, it sounds like the direct short bus to a mental breakdown. Which I had, over the weekend minus the children. I did not realize how super helpful, supportive and ‘just there for me’ that my wonderful husband has been. I did not realize how helpful my sister has been either. Both of them moreso during this past week then normal. (THANK YOU! I LOVE YOU BOTH!) Apparently even I didn’t see what they did. I was stressed to the max and frazzled beyond all recognition of who I used to be. I kept ignoring their subtle hints and signals. I didn’t listen to their advice nor take them up on offers to help with dad. Then, I hit the wall at full speed. I had been so focused on dad especially during this past week because of my uncle’s death that I let dad break me down and burn out any semblance of patience that I used to have. A few months ago it would be everyone else frustrated with dad and I’d shrug things off like nothing even happened. How did things change? I am useless to anyone if I, myself, am not well mentally and physically. Over the past few months, more and more issues have surfaced with dad regarding his health. He’s discovering that by having not paid much attention to the signs of his Diabetes, he has neuropathy issues going on with his legs and feet. He used to downplay the questions whenever a doctor or nurse would ask about them. When dad had his TIA/mini stroke, he was told during phsyio and recovery that he should take up crosswords or puzzles or something to engage his brain activity to help keep things flowing ‘up there’. He poo-poo’ed that too saying he was ‘fine’. His memory isn’t what it used to be and he’s often using synonyms for the words he wants to use but gets overly frustrated that he can’t think of the exact word. Overall, he’s getting older and not liking it one bit. I don’t blame him, one day your body’s fine and the next, it’s deteriorating on you. Hard realty to swallow. Am I embarrassed that I blew up at my own dad? Of course. (Though somewhere deep down inside I still have that ‘He had it coming’ twinge) Did I apologize, no. Did he ever apologize? Good heavens, that will never happen. (Never say never right?) But I’m sure that while we both had our moment of weakness, we still knew that we still loved one another. The same with the hubster and my sis…all they could do is wait for me to hit that wall to help pick up my pieces. (BTW I’m sorry for taking things out on you that did not pertain to you as well as not listening to either of you beforehand). Now, I need to figure out how to focus less on dad and more on ME so I can slowly rebuild/glue myself back together. See what I mean about that ‘Super Moon’ affecting everyone? How did it affect you this past week/weekend? Wasted about 4 cups of cherries. How I found them, I opened the lid to see them waving me. Yep. THAT bad. We just went through a crazy hot and humid spell – IN SPRING I might add and since, I seem to have become very addicted to Perrier. I have no clue where sudden new love came from but it started to get so out of hand that I actually contemplated buying in bulk from Costco! Whoa, right? So not good for the grocery budget. Especially something that’s gone once you’re done drinking it. There’s no justification for purchasing it either. Out of necessity, I had to figure out a way to duplicate this tasty drink without breaking the bank. I put on my creative thinking cap and pondered. What flavour of Perrier do I enjoy? Lemon. Hey…I have True Lemon in the pantry too! 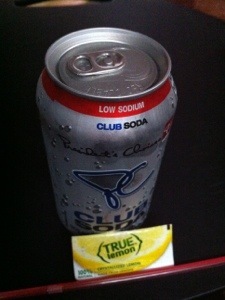 A can of generic Club Soda + 1 packet of True Lemon = instant homemade Perrier! Now I know there are some purists out there that would like to disagree but for myself and I’m sure other frugliates out there, this will be a welcomed substitute. Can you imagine my shock as I had that epiphany? Here I was paying the high price for Perrier when I had all the makings for it at home, right under my nose! There’s something about the True Lemon that a wedge (or two or three) just can’t duplicate. And the other flavours of True Citrus (orange, lime) are just as tasty. So that’s my food waste this week, pantry items. It seems that as soon as I focus on one area, another one seems to flare up. With the heat upon us now (or rain?) I guess its time to be super diligent with monitoring ALL the food in the kitchen to prevent waste. 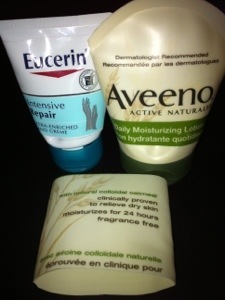 Ever get to the point where you can no longer squeeze lotion from a tube container so you consider it fit to be tossed into the garbage? And I truly do mean squeeze and twist and push and try to force it out. Every. Single. Bit. Out. Well, have I got a tip for you. Empty tubes. Or are they? 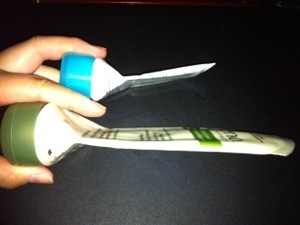 I took a pair of scissors to the tubes about 1/3 up from the bottom. Look how much was left!! In case you can’t really see, there’s about 1/4c left. To make a ‘lid’ for the tubes, trim down any excess tubage (yes, I just made that word up now) and proceed to slide the remainder of the tube over top of the base. Voila! 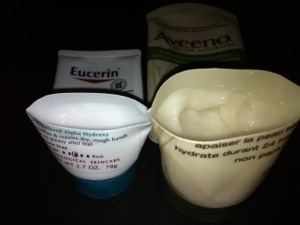 All you have to do is lift the ‘lid’ dip your finger in and remove as much as desired then re-cap. Talk about getting your money’s worth. A late start for the year but I can finally say that the garden is in! Last week the wonderful hubster and I added a years worth of crushed eggshells to the garden beds to help bump up the calcium content and well, to feed it. Then we tilled and watered it immediately as well as needed for about a week. Lets just say that Mother Nature helped out a lot as it seemed to have rained for a week straight. I guess we picked a good day to til the beds! Hopefully this year’s crop will be plentiful and give a large yield. Have you put your garden in and what have you planted? Oy! What a week. I hate to admit this let alone share this but there has been plenty of waste around here. During my usual Tuesday night fridge inventory, organize and clean out, I found the mother load of spoils. I had been taking dad’s word for the vegetable produce – if it was OK, if we had enough. Well! We had more then enough. So much so that the veggie drawer was overflowing with rotting vegetables. It was like they were starting a coup or something. Let’s just say that I should be thankful that everything was in produce bags and that the liquids stayed contained in the drawer. 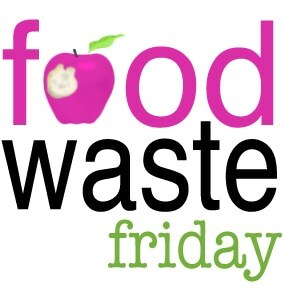 Wasted: 12lbs of carrots, 1 head/bunch of celery, a large head of romaine lettuce and 1/2 bag of spinach. Yes. I said 12lbs of carrots. 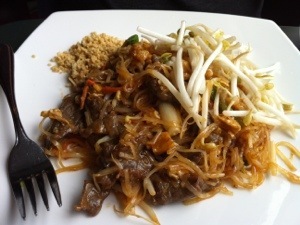 My sis and I got a chance to check out a thai restaurant that we’ve passed numerous times. We always thought it was a greasy spoon hole in the wall take out thai place but we were pleasantly surprised when we walked in. It looked mighty spiffy like it had been on one of those restaurant make over shows. In addition to a regular menu, they offered lunch specials which we decided to try. 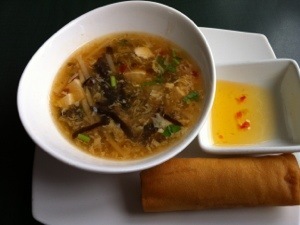 Each lunch special came with the soup of the day and a spring roll in addition to your entree. Green curry chicken w/steamed rice. Love the lil heart they cut out! Ever been pleasantly surprised by a restaurant which you thought would be a hole in the wall?